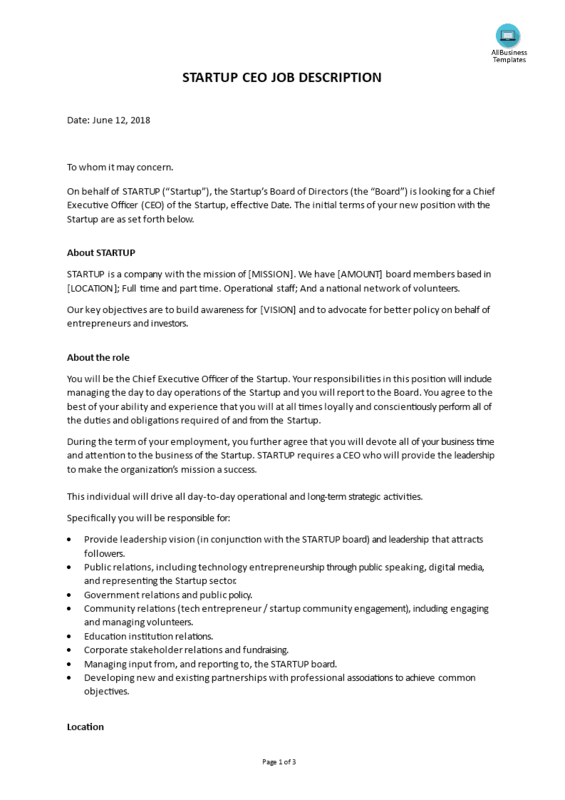 Are you looking for a Chief Executive Officer Job Description for a Startup? This CEO job description template provides a guide for you to use in order to simplify the process for the positions that you need to fill in. Job purpose: a brief description of the general nature of the position; an overview of why the job exists; and what the job is to accomplish. The job purpose is usually not more than four sentences long. Duties and responsibilities: list the primary job duties and responsibilities using headings and then give examples of the types of activities under each heading. Working conditions: if a person has to work in special circumstances, such as shift work, working outdoors, working with challenging clients, etc. Physical requirements: if the job is physically demanding like one is required to stand for extended periods of time, lift heavy objects on a regular basis, do repetitive tasks with few breaks, and so forth. Direct reports: list by job title any positions to be supervised by the incumbent. Ideally, a job description should be reviewed annually and updated as often as necessary. Having a ready-made job description example will save you and your Human Resources or Recruitment Department time, cost and efforts! For that reason, download this Startup CEO Job Description template now to reach the next level of success in your recruiting process to find the right candidate! Download this CEO Startup Job description now!